The river Gannel has created a narrow tidal flat between steep sided low hills. I came upon this from the side where a smaller spring joined the flow. I cycled as far as I could until my road was submerged, stopped there, looked down and drew the water as it flooded and retreated against the silt, grass and planks bordering the path. I drew, as usual, in fountain pen and water, light strokes of conte crayon and then strengthened the shapes of the wavelets with brush pen and black ink (shown below). The heavy black ripples were a mistake, unbalancing the sketch. I wanted to highlight the posts and planks against both silt and water. Dissatisfied, I reworked the mud bringing in pinks and blues to supplement the ochre. I rebuilt the wavelets textured white acrylic ink and, when dry, rubbed in crayon, losing all but a few white reflections. It won’t bear further manipulation and the image is now too distant in my mind, so this (above) is how the sketch is finished. On a damp afternoon, I sheltered from drizzle beneath a tree on a terraced slope above the Elizabethan manor, Trerice. The children were inside dressing in mail and armour. The house has a knot garden built of aromatic herbs and bordered by laden apple trees. 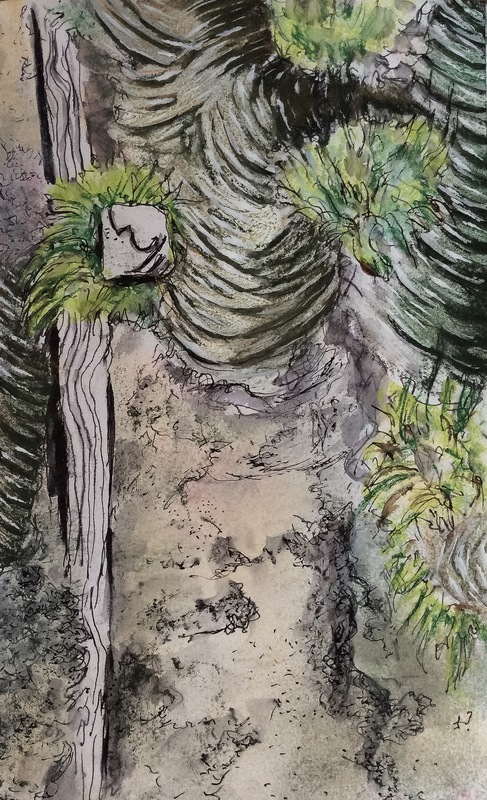 I made only one sketch on our next day out at the Eden Project, quickly drawing some of the sculptures set within the Mediterranean climate biome. I was impressed by the vision of those who had created a landscaped ecological museum in the desolation of a worked-out clay mine. When living through events, it is almost impossible to distinguish the momentous from the trivial. In the aftermath of the ridiculous EU referendum I found myself hooked, obsessively following the news hour by hour. The government resigned and was swiftly replaced. At that moment of vulnerability, the Labour opposition collapsed and its dazed MPs went on strike against their constituency members. I scoured the media for who would be the charismatic thoughtful emerging leader to challenge the hapless Corbyn. After various false starts, a public relations manager from the pharmaceutical industry emerged as the people’s champion. The two descended into an insane virtual bidding war, each making more fantastical promises. It seems obvious that wild policy proposals are trivial when future events are unpredictable. I want to hear how they would make government resilient in the face of new unexpected challenges, holding to principles and not taking the well-worn easy path of offering divisive iniquitous answers to difficult questions. I have tried to tell them this, on Facebook, in the Guardian comments section, even shouting at the radio, but they don’t seem to be listening. 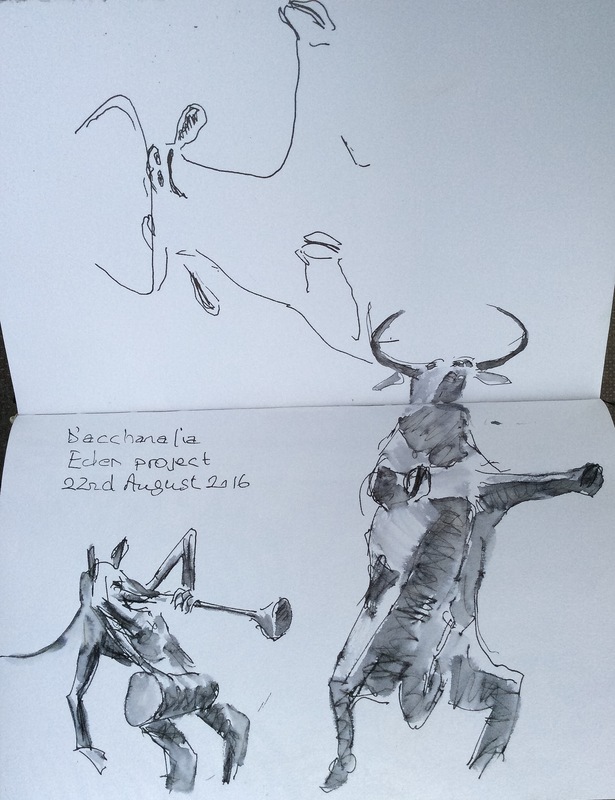 National events, work and family (perhaps in that order) pushed aside sketching and posting on this blog. I am catching up. 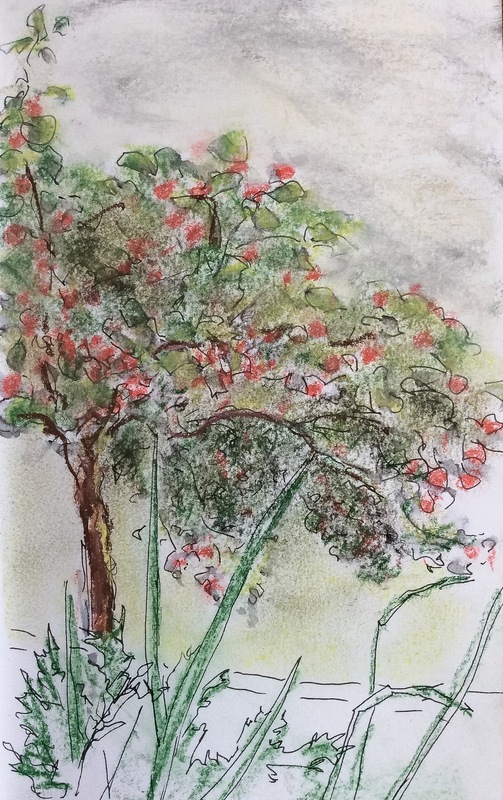 Above is a small drawing done at Kenilworth Castle in mid June. 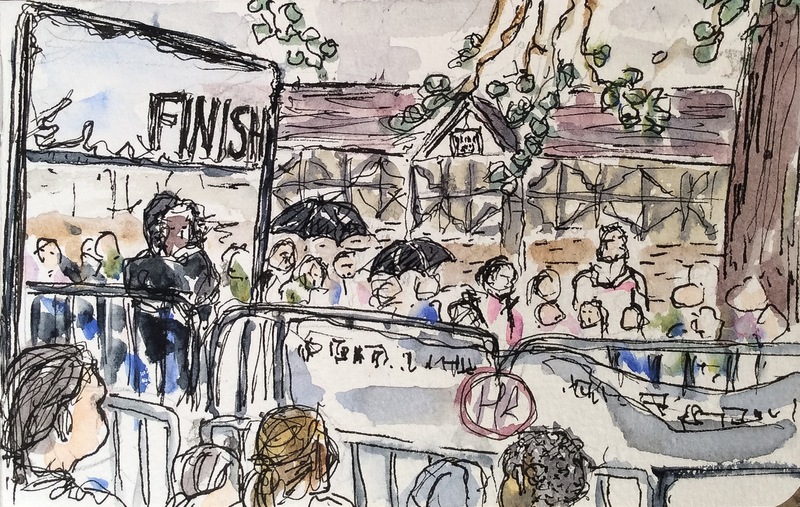 I was waiting for my wife to cross the finishing line for the Two Castles 10km run – originally I left a space for her in the sketch but she arrived obscured behind two large men so the drawing was completed without her. The back of my nephew’s head can just be seen front right. 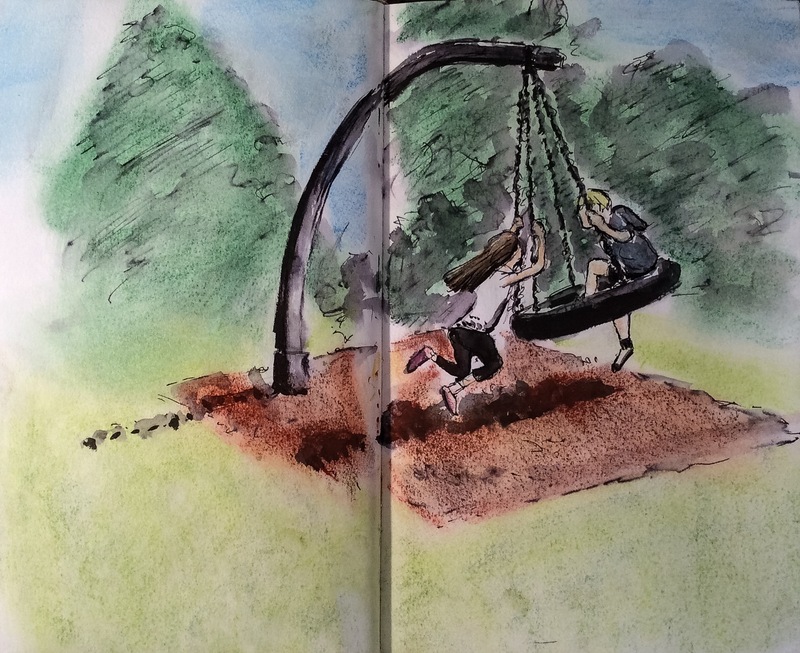 Here, more recently, the children are playing on a tyre in the park. This one was from half term in May. 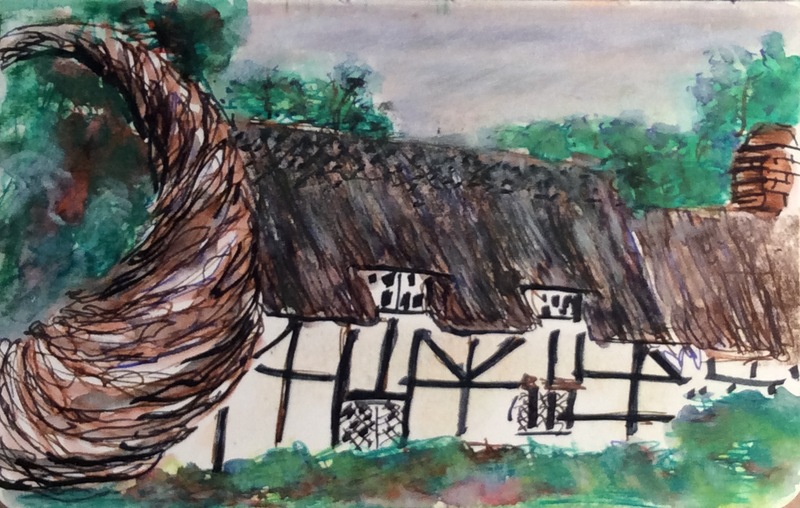 I had taken the children to Anne Hathaway’s cottage, fitting in with the school’s focus on Shakespeare. In the foreground is a large round sculpture woven from coppiced twigs, in which the children were sitting. 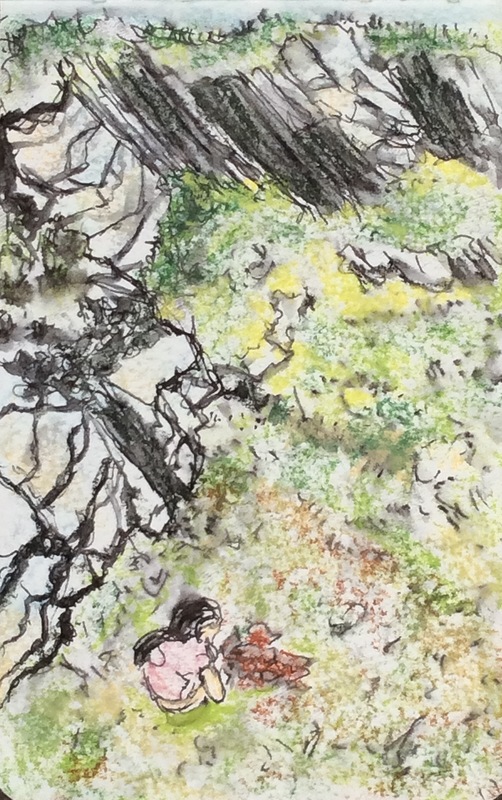 Below is a small drawing on rough paper from last Thursday, done when walking on the north Cornwall coastal cliff tops. 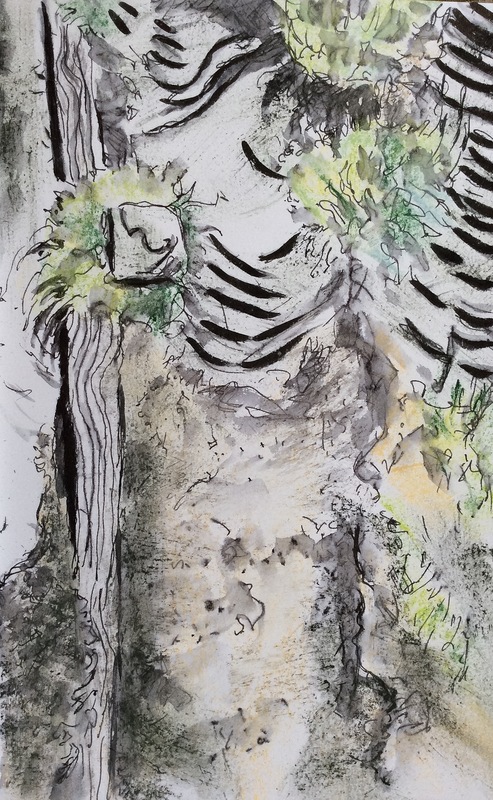 My daughter is beneath me, crouching in a rocky hollow, investigating shale stones made brittle in someone’s campfire. I am partway through reading Robert Harris’s trilogy set at the time of the collapse of the constitution of the Roman Republic and the centralisation of power in the hands of the emperor. Republican politician Cicero can hold back the storm for a few years but history rolls on. Much that must have seemed so important at the time has blown away like dust. Once again I notice I have reduced the natural world to interlocking rectangles. 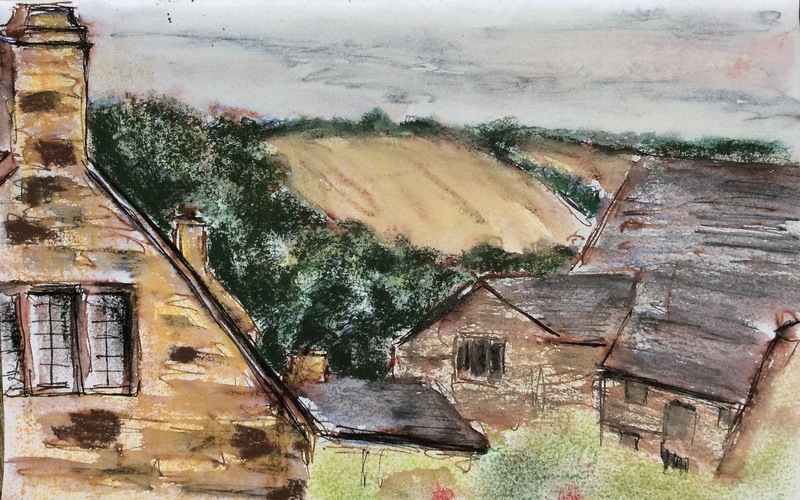 This small sketch was done using fountain pen and conte crayon, on site but with corrections to tone balance and colour done later. The key components are bulrushes at the edge of a flooded gravel pit, and a small hawthorn bush.